Tense Hours, Then Sighs Of Relief After Huge Quake Off Chile : The Two-Way Early reports indicate at least six people were killed, but that a major disaster may have been avoided. The temblor did generate a tsunami, but the waves apparently did not cause extensive damage. 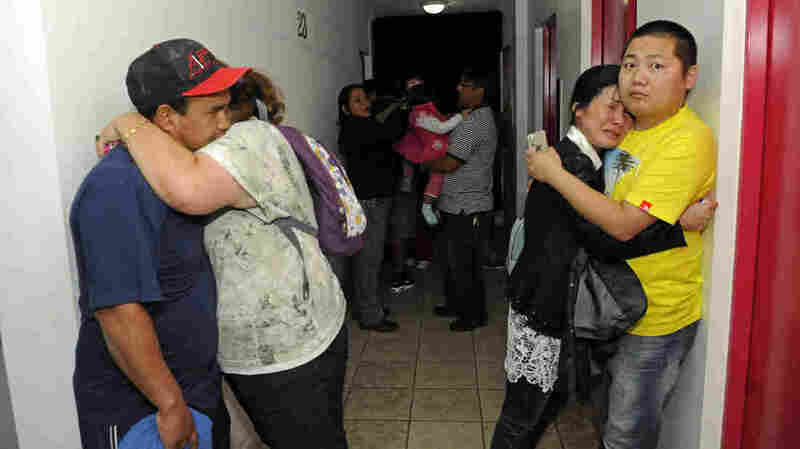 Scared residents hug in the hallway of an apartment building Tuesday after Iquique, Chile, was rocked by a strong earthquake. The extent of the damage isn't yet clear and the six deaths reported so far may be followed by news of other fatalities. But on the morning after a massive, 8.2 magnitude earthquake off the coast of northern Chile there are sighs of relief there and in neighboring Peru. "At a time when horrific natural disasters have become an everyday part of the news cycle, it appeared one finally missed," The Washington Post writes. Andres Azocar, a Chilean journalist, wrote on Twitter late Tuesday that "luckily, so far, [it] seems not to have been a disaster." "The Pacific Tsunami Warning Center said the quake generated a large tsunami with the biggest wave reported at about 2 meters. The Chilean navy said the first big wave hit the coast within 45 minutes. Early on Wednesday Chilean authorities canceled their tsunami warning for most coastal areas." NPR's Lourdes Garcia-Navarro, who has been monitoring the news from Brazil, tells our Newscast Desk that "for most of the night, residents of northern Chile huddled in shelters after most of the coast was evacuated. ... But it could have been much worse, according to observers and newly inaugurated President Michelle Bachelet. She took to the airways to praise the country's preparedness. ... A mostly orderly evacuation followed after the quake struck." According to the U.S. Geological Survey, the temblor's epicenter was in the Pacific Ocean about 59 miles west of Iquique, Chile, and about 12.5 miles below the seabed. It struck around 6:46 p.m. local time — 5:46 p.m. ET. This image from the U.S. Geological Survey shows the location of Tuesday's earthquake (marked by a star) and the relative severity of the shaking felt on land. The areas shaded in yellow were shaken the hardest. 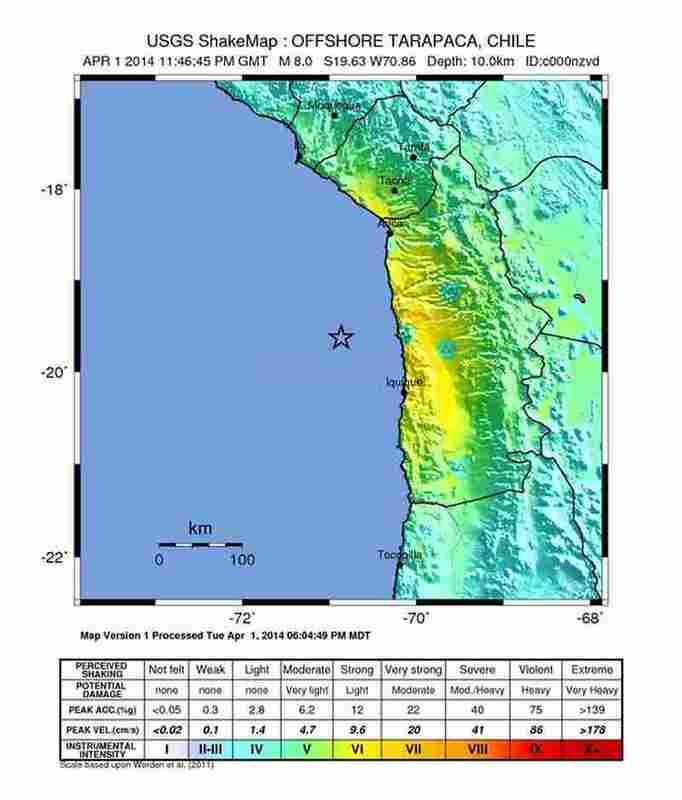 The Associated Press says "the quake was so strong that the shaking experienced in Bolivia's capital about 290 miles away was the equivalent of a 4.5-magnitude tremor, authorities there said." "The extent of damage from Tuesday night's quake couldn't be fully assessed before daybreak, [Chilean] President Michelle Bachelet said, but she wasn't taking any chances. She declared a state of emergency in the region and sent a military plane with 100 anti-riot police to join 300 soldiers deployed to prevent looting and round up escaped prisoners. "The shaking loosed landslides that blocked roads, knocked out power for thousands, damaged an airport and provoked fires that destroyed several businesses. About 300 inmates escaped from a women's prison in the city of Iquique. In Arica, another city close to the quake's offshore epicenter, hospitals treated minor injuries, and some homes made of adobe were destroyed, authorities said." As Wednesday dawned, news outlets were reporting that at least six people had been killed. "Tens of thousands" had been evacuated, the BBC writes. It adds that "officials said the dead included people who were crushed by collapsing walls or died of heart attacks."